This story was originally written as part of our Pakistani Independance Day package this year. The story is still relevant and of course, as always, let us know if you think we need to add more to this list. 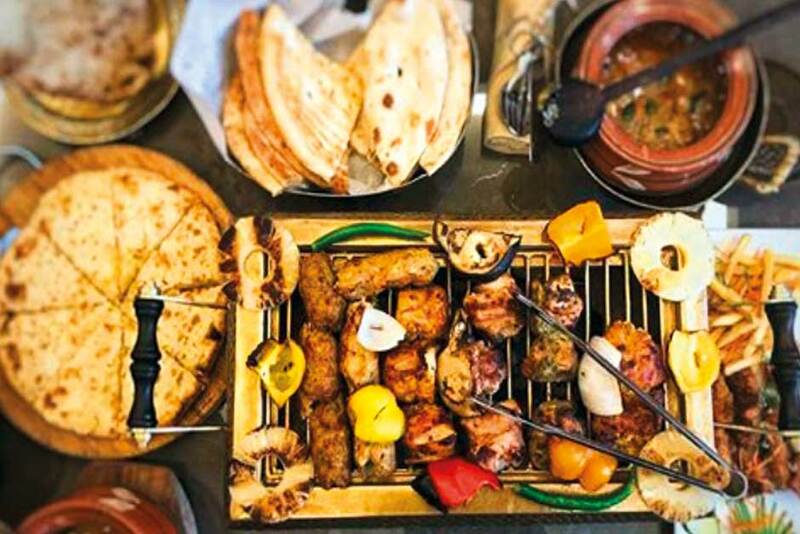 In celebration of the 71st Pakistan Independence Day, we wanted to share our top 13 restaurants where Pakistani expats can enjoy some delicious reminders of home. Why not go out with the family and grab a bite to eat! Here is our list of where to eat this week, Pakistani style. FYI, this list is in no particular order. We love them all equally! If you’re a fan of Nihari and beef that melts in your mouth, look no further than B&B. Located near Lamcy Plaza and more recently in Motor City, BnB Cricket Bar serves arguably the best Nihari in Dubai. They also serve great Halwa Puri, which is a very popular 'weekend breakfast' back home. Bar B Q has had rave reviews from Gulf News readers, who insisted that this one needed to be added on the list. This Pakistani spot has a huge range of foods, as they offer an open buffet concept. Whether you try the Shami kebab, Reshmi kebab, Malai tikka or fried fish, the quality is great and the taste is delicious. Their chicken biryani is also a winner. Their service is helpful and welcoming. Make sure you end your meal with some Gulab Jamun and their Shahi halwa, which is apparently sugar free, so even diabetics can enjoy the food. Located in four different areas across Dubai, I love the Kebab Shop because of their incredible Kebab Masala tucked away in the signature curries section on their menu. The Kebab Masala is a thick curry made with a unique blend of spices and juicy seekh kababs (BBQ’ed minced meat kebabs) which goes best with fresh tandoori rotis and raita. I don’t know where to begin and where to end with these guys. There are so many great options on their menu that I have a hard time selecting what to order. Luckily, they have a buffet option which I almost always opt for because a little bit of all the good stuff is better than a lot of one good dish! If you are planning to lose weight, don’t even think about going there. The buffet ranges from a range BBQ’d meats, curries, seafood and even Chinese food. The best part about their buffet is the huge BBQ grill that sits on your table so that you can have piping hot food without having to get up. Spinzer serves a variety of Pakistani dishes such as Bun kababs, curries and BBQ. But the reason why this restaurant made it to this list is because of their Kebab rolls. Kebab rolls are the desi equivalent of fast food wraps which come in a variety of chicken and mutton flavours. If you are trying to stay fit they also serve these rolls in a Chapati rather than a deep-fried paratha. As a rule, don’t forget to ask for extra chutney to really give those rolls the extra zing! What good is a list of Pakistani restaurants without Biryani? There have many been claims about places claiming to serve the best biryani in the UAE, but for me, the Pak Lyari’s Mutton biryani is a clear winner. Tucked away in Meena Bazaar, Pak Lyari takes you to a trip back home with just one bite of their mutton biryani. If you are not a fan of mutton, their chicken Biryani is equally good. Of course, your meal won’t be complete without the Zafrani Kheer for dessert. Yes, a lot of their cuisine is Afghani, but I’m not one to let geography come in the way of amazing food. Located in Barsha and more recently in Al Nahda Dubai, Wakha is my go-to place for Chapli Kababs. Apart from Chapli Kebabs, I would highly recommend their chops, Afghani Pulao and Shinwari Karahi. The peculiar name of this restaurant stems from the history of this restaurant. It was a small roadside establishment aimed at selling biryani to students, hence the name Student Biryani. Since then the outlet has come a long way adding more items to their menu. Although their biryani is a top contender for being one of the best, I love this place for their Haleem, Shami Kebabs and their piping hot tandoori roti. Hot n’ Spicy has a great variety of kebabs, including the tasty chicken malai boti. Definitely one to try this week. This upscale Mughlai themed restaurant, serves delicious Pakistani food in a traditional buffet setting. Some stand-out dishes are the mughlai, tandoori and an amazing live Barbecue station that offers great traditional Indo-Pakistani cuisine. This famous Pakistani restaurant is legendary here in the UAE. A crowd favourite and loved by everyone. Founded in 1978, Delhi Nihari is one of the best Pakistani spots located in the heart of Sharjah. They offer flavorful food without breaking the bank. In fact they are known for great quality foods at very low prices. We recommend their bihari kebab and mutton biriyani. A well-loved restaurant with great variety including grill and barbecue items. If you work nearby, make sure you head to Daily Express during lunch for their great lunchtime buffet. They have great Biryani and a variety of dal, making it a great option for vegetarians. The famous Ravi is a favourite among many locals and expats in the UAE. They have delicious Pakistani food, including chicken tikka, mutton Peshawari, chicken Peshawari, butter chicken and dal. Head over there to celebrate Pakistani International Day.